Bending wood seems a little mysterious at first, but gets easier to believe after having done it for oneself. 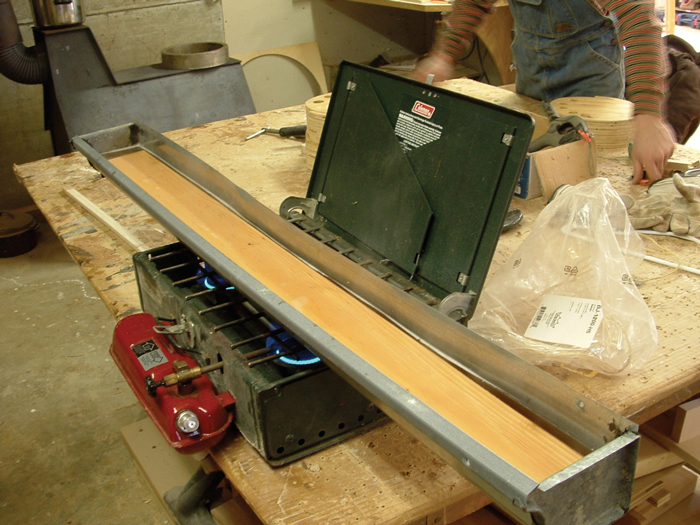 There are several ways to bend wood: boiling, steaming, and ammonia treatment. Boiling is the way that I have done it with the most success and least gear. An old piece of guttering works well for a boiling pan as it is long and narrow. It can be heated on a Coleman stove or set across the burners of a kitchen stove. After boiling, the wooden strips are bent against a thick aluminum hoop that can be heated on a stove. This drives the moisture into the wood and makes a nice gentle curve. At times I have skipped the aluminum ring step, using only plywood spools for bending. However, the more highly figured a strip is, the hotter it needs to be for successful bending without cracking. I like to have some way of driving the moisture deeper into the wood. After bending on the aluminum ring it is good to roll the strips up onto a plywood spool to allow the bend to “set”. 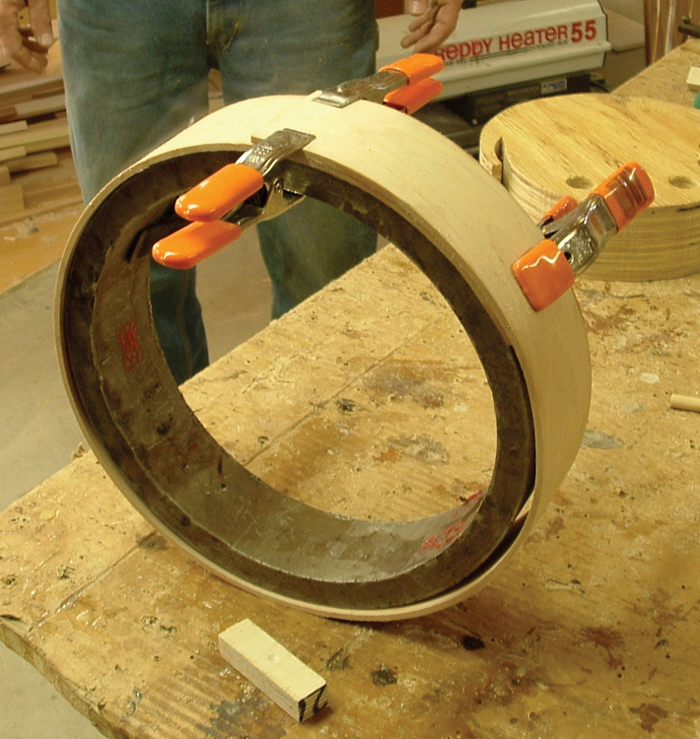 Each plywood spool is about 10″ in diameter and about four inches tall with a mouth cut into it to accept an end of the strip. Spools also have holes drilled into them to facilitate clamping the strip in rolled position. Boiling strips on the stove for banjo rim bending. The heated aluminum hoop with a strip clamped to it. This drives the moisture deep into the wood. Rolling the boiled and steamed strip onto a wooden spool for drying. 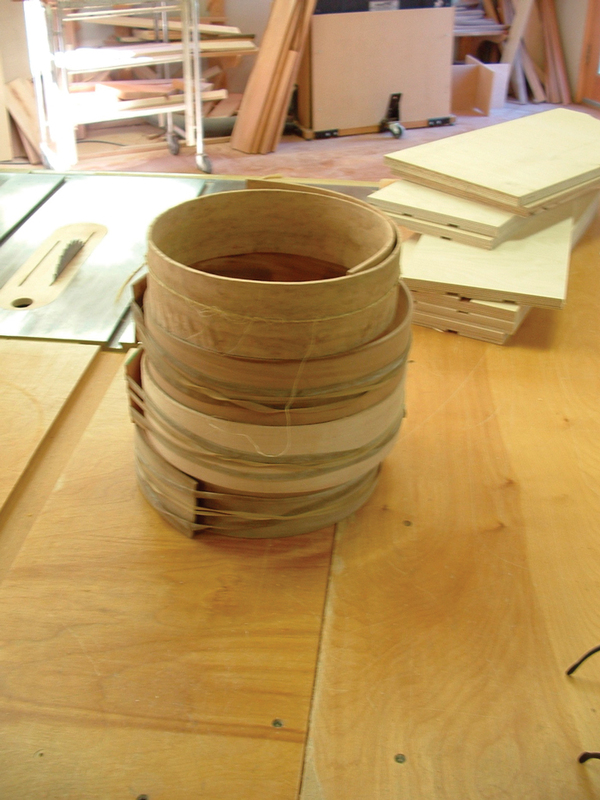 Bent wooden strips that will be used to make a banjo rim. The sanded strips are soaked in water over night to get them as saturated as possible. Put the strips in the pan and get it boiling hot, the strips float less when they have reached maximum saturation. Have tongs and gloves handy for handling the strips when they are hot enough. Also wear a thick shirt, the operation of rolling the strips onto the spools often needs some help from the belly. If you have one, use the heated metal ring to make the initial bend. 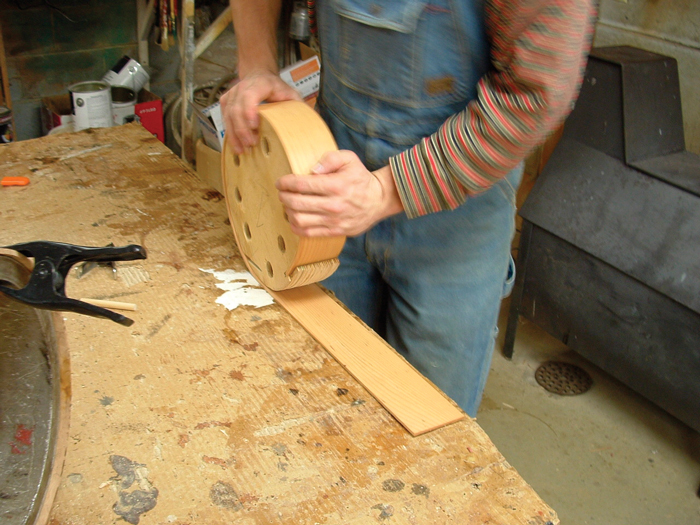 Then roll up the strip onto one of the plywood spools. Clamp it in place and leave it to sit until it is cooled off. After cooling, remove the strip and tie it up with some twine or string, hang it up to dry for a while. When bending strips it is common to break some in the process, others will end up with split ends. That’s normal and should be planned for. There is a bit of set up involved in bending so why not do several strips while you’re at it, at least six or seven.